Born on the 4th of November in 1965, and grew up in the beautiful city of Adelaide in South Australia, GM Vince Palumbo or "GMV" as he is commonly known, began his combat arts training at the age of 8, starting out in boxing and gymnastics. Then by the time that he was 10, he had made up his mind to start learning the basic Judo/Jujitsu skills. When he turned 15 years of age, he started training in the martial art style of Freestyle Karate, and he achieved his Black Belt by his 18th birthday, this was after 3 years of rigorous training. At 18 years of age he started to learn the Korean Martial arts of Taekwondo, Tang Soo Do, and Hapkido, and he also earned the black belt in these styles as well. Vince Palumbo started competing in those combat sports fighting arenas at the age of 21, and since his first full-contact fight, he has won many - a State, National and International Titles in the different combat sport disciplines that he has fought in. He has had nearly 300 full-contact fights in the combat arena, and he's competed in the Karate, Taekwondo, Shootboxing, Kickboxing, Boxing, Grappling and Stickfighting Tournaments. GMV's achievements in the Martial Arts, also gave him the really great opportunity to appear in three martial arts movies called -'FINAL COMBAT' Directed by Menahem Golan, 'CONFESSIONS OF A PIT FIGHTER' Directed by Art Comacho, and 'BIRTH OF WARRIOR' directed by Gordon Waddell. Being a senior student of Supreme Grandmaster Cacoy Cañete, a legitimate 12th Degree Black Belt of the Philippines, so this makes GMV proud to call him his most significant martial arts teacher. He first met SGM Cañete during a seminar in Alice Springs many years ago, the seminar was hosted by GM Martin Gardiner, he is a real pioneer of martial arts in the 'Outback' of Australia, and this fine man was also GMV's first Doce Pares Eskrima teacher. Since then, GMV has been training Cacoy Doce Pares Eskrima and the Cacoy Pangamot Filipino Jiu Jitsu, so he has been travelling to the Headquarters in Cebu City, Philippines almost every year in the last 20 years for more training and tuition. 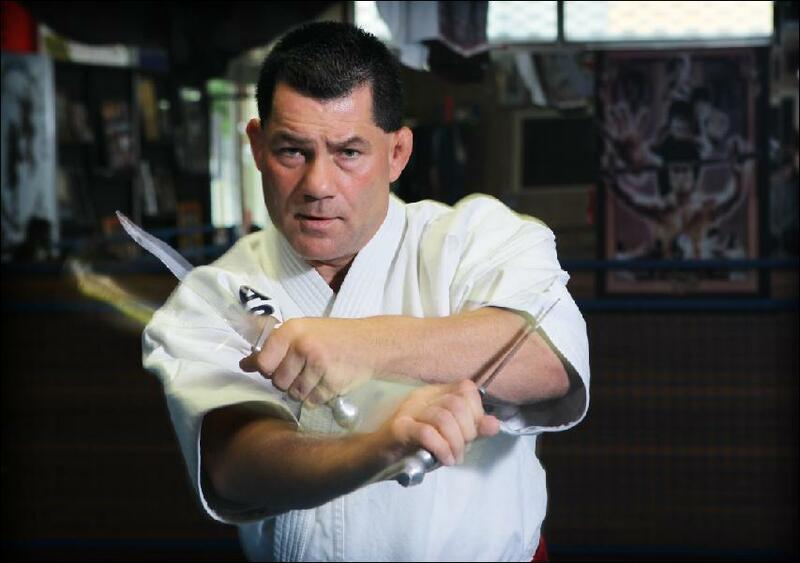 He's currently Chief Representative of Cacoy Doce Pares Eskrima World Federation in the Australasia region, and the Headquarters is at International Combative Martial Arts Academy which is based at 96a Grange road Welland, South Australia 5007. Grandmaster Vince Palumbo has been conducting Martial Arts seminars for the member clubs & non-member clubs in Australasia Region, and even to martial art clubs around the world. A Seminar can take place over the course of a week or weekend, personally handled by GMV himself. This way, the students will have the opportunity to train with an Internationally Accredited Instructor, and multi-awarded Martial Arts fighter. Anyone is welcome to take these seminars because you don't need to have any prior skills or experience in the Martial Arts to get the benefit. A GMV seminar can be on Filipino Martial Arts, Arjukanpo Karate, or Boxing and Kickboxing. Interested parties can contact by phone or by email. Kindly refer to our Contact Us Page for more details.